Following a slip of the tongue in which he described war in the Middle East as ''unforeseeable'', Minister for International Development Simon Foster (Tom Hollander), finds himself in a quagmire of farce and intrigue as those for and against the war try to use him as a fulcrum to give their case leverage. Flown over to Washington, new aide, Toby (Chris Addison), in toe, Foster has to contend with American politicians (Mimi Kennedy and David Rasche), a dovish general (James Gandolfini) and the P.M.'s pernicious and prurient Press Secretary, Malcolm Tucker (Peter Capaldi), as war seems ever more likely. 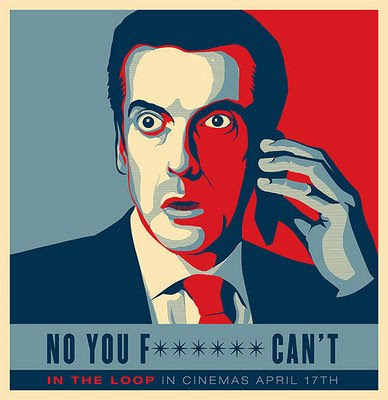 A non-canonical spin-off from his BBC series, 'The Thick Of It', Armando Iannucci's 'In The Loop' is possibly the funniest film I've seen in the last five years. Much like the series, there is a relentless pace to each scene with fouled-mouthed witticism or ludicrous dollop of stupidity following fouled-mouthed witticism or ludicrous dollop of stupidity. As with the TV show, Malcolm Tucker is the highlight of proceedings. He is a whirlwind of spite and bile, appearing almost out of nowhere to constantly bully every character unlucky enough to get in his way until he can get what he, or at least the people he works for, wants. Capaldi has a ball as Tucker, and clearly relishes his opportunity to kick arse and turn the air blue on a whole new continent. James Gandolfini, as the anti-war General George Miller, is the other focal point of the film. Finding himself railroaded by ideologues and facing down a major conflict, he gets plenty of laughs, whether conversing with Mimi Kennedy's Assistant Secretary of Diplomacy or confronting Tucker, but also brings a degree of pathos and gravitas to the role that lends a certain amount of weight to his humour. Gandolfini fits very neatly into Iannucci's world, and acts as a nice heroic figure for the majority of the time. As well as an international cast and setting, the other thing that sets In The Loop apart from its small-screen relative is its scope; the problem facing the Minister is not the failure of the Snooper Squad to find leverage with the P.M., it is whether or not he will be party to a full-scale war. Admittedly there is some small-scale stuff involving Steve Coogan and a wall which feels much closer to the spirit of The Thick Of It, but even that acts in service of the main drive of the plot, which is a satirical look at the behind the scenes finagling that led up to the war in Iraq. This justifies the need for the film to be set outside of the comfort zone of the TV show, but it also made for my one caveat about the whole enterprise; its conclusion which, even considering the caustic nature of The Thick Of It, is somewhat dark, and it came as something of a shock to me after I'd spent the previous 90 minutes in peals of laughter. I realised that, in amongst all the swear words and jokes about masturbating to shark documentaries, there was a seriousness to what was happening. This shouldn't be a surprise, though, since it stems from the very nature of the film; if it's to be a true and honest satire of the lead up to the Iraq War, it has to end with a war. The elements that the audience are, or at least should be, against must ultimately win out and the 'good' character must betray their own beliefs or be destroyed for having them, all you can say at the end is a simple, ''That's that, then''. If 'The Thick Of It' was 'Yes, Minister' for the twenty-first century, then at times 'In The Loop' verges on being a Dr. Strangelove for the twenty-first century; it's caustic, dark, incredibly sweary and, up to a point, deliriously funny.